I am writing this morning to bring attention to the bands of energy that are being brought forth with the peak of the Orionid meteor shower in compliment with the upcoming full moon. With Venus at play, we are being asked to dig deep in our relational fields to balance the ways with which we relate to ourselves and our peers. This comes down to the very basic interactional level of how we treat one another and allow ourselves to be treated. This layer of healing is important. So much of our lives are connected to and influenced by our relationships with one another. Friendships, families, our teammates, and the people we work with can bear significant influence on the overall tone of our lives. As we realize through our healing journey, these are the relationships that make our lives tick. They can also be a big part of what we need to shift as we grow. Our unprocessed emotions can create a veil through which we unknowingly view the world. Left intact, this veiling acts as a filtration system through which we interpret ourselves and our interactions. Though we are most certainly doing the best we can, there are moments where that which we have not yet attended to in our souls history unknowingly (to us) creates openings for further energetic rifting. If we allow ourselves to be led with our fears and/or in patterns that are no longer in alignment, we will create that situation. In short, our beliefs create what is termed in psychology as a self-fulfilling prophecy. We are the masters of our reality. What is so special about ascension is that how we proceed is up to us. There is no obligation to remain connected to our old narratives. Rather, moments like this where vibrational imbalance is being highlighted by the meteors and moon are powerful opportunities where we may create everything anew. This moon and the shower are asking us to go deep. As we cut into the darkness with our beacons of realness, we are then given the opportunity to do the same old thing (repeat our patterns) or to hike out of the brush cutting a new path. This can be applied to our own personal timelines as well as to those which we are connected by soul group and various other forms of energetic association. There are rifts that run deep within many of our collectives that influence the context within which we act, as soul groups but also in terms of the overall trajectory of ascension and how the process is being done. I work on these collective timelines as part of my own service. Like personal healing, collective balancing also occurs in layers. Recently, I have been working with the lightworkers collective on teams and interpersonal relationships; integration of divine masculine and feminine; and intergalactic ascension process. Which types of energy you may work with as part of your embodiment process plays out is in large part determined by your souls’ trajectory and where we are at in alignments with your healing and what is being moved by your collective. It has been a great joy to watch divine masculine balancing manifest all around and through us! HOW DO I KNOW THAT SOMETHING IS BEING BROUGHT UP FOR RECONSIDERATION? – A pattern that we have experienced before is being brought up. Even if we have analyzed it and done healing work around it. Its repetition can suggest that it is either heavily connected to our soul group trajectory and/or we have another layer of self exploration to engage in. *NOTE 1: Once you have worked through this pattern as part of your own healing journey, you are not obligated to continue dipping into that collective soul group experience through embodiment of that lower vibrational timeline. Moving forward into creating new forms of relation is a helpful choice. NOTE 2: As far as I have seen, it is possible to continue experiencing the pattern and creating the new timeline simultaneously. This creates bridges for those who are ready. – Thoughts and beliefs that we have held before seem to play out in a dual reality scenario where you can feel the energy of the thought or belief pattern as present but are knowingly operating through another version of reality. Do you ever have two videos playing on your web browser at once? You choose the one you want to hear. – You are having a heightened energetic experience like rushing thoughts or emotions (as I have described in my video ‘the review’ which you can find on my youtube page, IndiCrow Energetics). These moments where vibrational imbalances and areas where we may invite in growth are highlighted can feel challenging and confusing. After all, they are rooted in the spaces within which we have yet to bring light and compassion and often include the people we love the most. They call upon us to think about the ways that we operate in this world, how that contributes (or does not) to our own personal ascension, and what we must do to remain in flow. This can feel especially challenging when we are working through long-standing personal and/or collective patterns. As noted, one of the best ways that we can move forward in our journeys is to step out of our older narratives and to begin forging new paths based on love, enjoyment, peace, and being free. Living with the conscious intention to create from your highest vibe potential series of actions is something that each of us can do. Taking the time to say you are sorry, giving yourself the permission to have a great day, and actively ensuring your personal energetic boundaries are all part of this. Being able to recognize an energy thread and whether we are willing to participate in its re-creation or whether we would like to make something new is our freedom of choice and creation. After all. 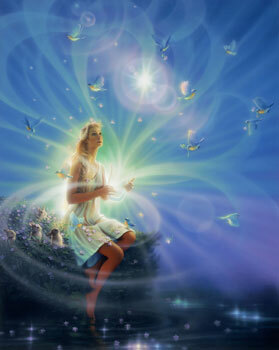 New Earth is a place created by us, our actions, and experiences. The strength of energetic moments like this current alignment can feel intense and ask us to go deep which can feel uncomfortable. We came here to do this now and you know what? Please note that I have created an open access library of ascension based videos throughwww.indicrowacademy.love. There are videos on everything from what timelines are to dna upgrading to the very basics of what ascension is. Life is always bringing us to the truth within us. When we play the game of pretend, when we live life with masks on, we will find that life strips away the pretence, the masks, when we least expect it. When we have nothing to hide, we live authentically. All is there open, for all to see: – the shadow and light. There is not one soul alive on this planet, who does not have a shadow side, as much as a light side. We are all both saints and sinners. It is embracing the whole – that we become whole. It is in living the truth – that we become truthful.